(And the Adults Who Help Them). We are now taking orders for the 2018-19 FAFSA season! The updated guide is free of charge, but we ask that you order only what you need. Supplies are limited and we want to make copies available to as many students as possible. To order, please read the instructions below. 2. FOR ALL OTHERS: Please use this website to order the copies you need. Select the button below to begin your request. All orders are subject to approval. We will begin shipping books in late September and will try to have the guide to you 2-4 days after request has been approved via FedEx. You can also request single copies and small orders using this website. Looking for a TRANSLATED VERSION of the guide? Or an ELECTRONIC VERSION? PDFs of the guide are available ten languages at: www.understandingFAFSA.org. An electronic version updated for this season will be available beginning October 1st. Feel free to distribute this link widely and to use the material in the guides in any way you wish. 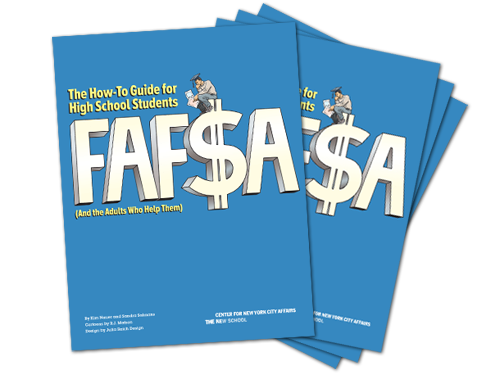 We are happy to provide you with the FAFSA How-To Guide. Please let us know if it is helpful and if there are ways the book could be improved! Feel free to e-mail Kim Nauer at nauerk@newschool.edu with any questions or comments.